Starting Monday, January 18th the 1,500 Subscribers Celebration will be back!! Be sure to check back for at least two giveaways next week!! You may have noticed too, that there is a new addition to the giveaway sponsors! 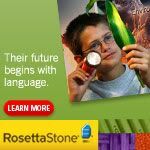 Rosetta Stone has graciously offered a full year of their homeschool language software! Can't wait for you all to start winning again next week! Rosetta Stone!! wooohooo!!! Please God, let me win! OH Jolanthe, how I've missed you. I check in everyday to see what's going on. I can't speak much myself about blogging I don't think I've posted in about 3-4 months. Rosetta Stone! How wonderful!! !